“Skywayaccident” by St. Petersburg Times. 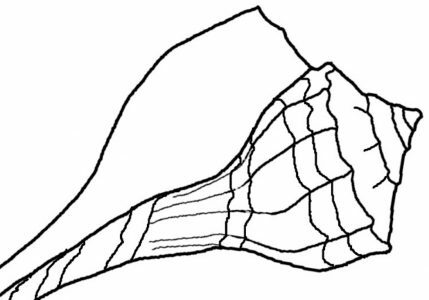 Licensed under Fair use via Wikipedia. With so much water in and around the state it’s not difficult to find famous bridges of Florida. So I’ll start at the beginning, and list two that I know something about personally. 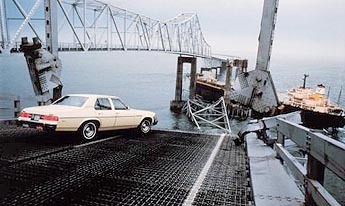 Right after I moved into the state, I remember the story of the ship that hit the Sunshine Skyway Bridge, over in Tampa (on the west coast), knocking out a section of the road. It happened in 1980 one morning when people were driving to work, or wherever they were headed at 7:30 am. There was a storm and the downpour of rain, that is typical in the state, left drivers with nearly zero visability. The ship took out a section of the bridge and vehicles just drove off into the water, never realizing that the bridge had vanished out from under them! And it was a very long fall into the water below. Only one person survived, and the picture above shows a car stopped inches from the edge of the broken road. How lucky was that guy? Visit the SkywayDisaster.com site for images, video and names of the dead (35). It was created as a memorial to the horrible accident. On a more upbeat note, the reason I decided to mention famous bridges of Florida was that my son, who still lives in Florida, told me that Kenny Chesney had made a music video on the old bridge in DeBary. It crossed one end of Lake Monroe where the water became a more narrow St. John’s River. We used that bridge often. It was part of Rt. 17-92 and was electrically operated to open whenever a large boat needed to pass through. This of course shut down traffic while the bridge did it’s thing. It was like letting a train pass by when the arms descend at the tracks. I discovered a picture of it on Wikipedia, and the information there calls it a “swing bridge”. Alas, the state grew larger with the enormous influx of residents and tourists (can you say Disney?) and it was replaced with a tall, modern bridge that would not hold up people who are always in a hurry these days. But I have a photo (don’t know where) of my little family (only one son at the time) sitting on the edge of the water doing some fishing near this historic landmark, back when it was in use. Back before Florida changed, and I didn’t know enough to appreciate it for the more quaint place it was. I was also not as familiar with the nasty wildlife that could live in Florida freshwater, like alligators and water moccasins, or I never would have sat at the edge of Lake Monroe!